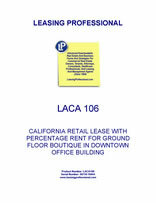 This Lease (the “Lease”) , dated for reference purposes only as of _________, 20__, is entered into by and between Retail Landlord, A California Corporation ("Landlord"), and Retail Tenant ("Tenant"). Landlord, in consideration of the rent to be paid and the covenants and agreements to be performed by Tenant, as hereinafter set forth, does hereby lease, demise and let unto Tenant, and Tenant hereby leases and accepts from Landlord that certain space in the "Building," as defined below, shown and designated on the floor plan attached hereto as Exhibit "A" and incorporated herein by this reference (the "Premises") for the "Term", as defined below, unless sooner terminated as herein provided. The Premises are leased by Landlord to Tenant and are accepted and are to be used and possessed by Tenant upon and subject to the following terms, provisions, covenants, agreements and conditions. d. LAND: That certain real property more particularly described in Exhibit "B" attached hereto and incorporated herein by this reference. e. PROPERTY: The Building and the Land and other improvements, fixtures or structures of any kind now or hereafter constructed on the Land. f. TERM: ________ (__) years. g. TERM COMMENCEMENT DATE: One (1) month from date of possession or upon Tenant's opening for business, whichever shall first occur. j. PREMISES. Approximately ____ usable square feet, known as_______ and located on the GROUND floor of the Building, as outlined on Exhibit A attached to and a part of this Lease. 2. TERM. The Term Commencement Date for this Lease is set forth in Subparagraph l(g) above. The Lease shall thereafter continue for the Term set forth in Subparagraph l(f) above. Tenant agrees that in the event of the inability of Landlord to deliver possession of the Premises to Tenant by the scheduled Term Commencement Date, this Lease shall not be void or voidable nor shall Landlord be liable to Tenant for any loss or damage resulting therefrom but, in such event, Tenant shall not be liable for any rent until such time as the Premises are "Ready for Occupancy" pursuant to the provisions of Paragraph 7 below. If Landlord has failed to deliver possession of the Premises to Tenant within six (6) months after the scheduled Term Commencement Date, Landlord or Tenant may, at its option, by notice in writing to the other party within ten (10) days thereafter, cancel this Lease, in which event the parties shall be discharged from all obligations hereunder. the Term, without any setoff or deduction whatsoever, the Annual Fixed Rent (sometimes referred to as "Fixed Rent" and "Rent") set forth in Subparagraph l(h) above, which rent shall be adjusted as hereinafter provided (but such rent as adjusted shall never be less than the amount set forth in Subparagraph l(h) above) in equal monthly installments in advance on the first day of each month during the Term, the first monthly payment to be made concurrently with the execution hereof. Should the Term commence be on a day other than the first day of a calendar month or terminate on a day other than the last day of a calendar month, the rent for such partial month shall be prorated accordingly. (3) All parking charges, including validation charges for Tenant's customers. Within fifteen (15) days after the end of each calendar month, following the Commencement Date, Tenant shall furnish to Landlord a Statement in writing, signed and verified by an authorized officer of the Tenant to be correct and showing the total Net Sales made in/upon, or from the Premises during the preceding calendar month. Within sixty (60) days after the end of each quarter of the Term hereof, Tenant shall furnish to Landlord a statement in writing, signed and verified by an authorized officer of Tenant as correct, showing the total Net Sales by months made in/ upon, or from the Premises during the preceding quarter at which time an adjustment shall be made between Landlord and Tenant to the end that the total Percentage Rent due for each such quarter shall be a sum equal to the above stated percentage of the total Net Sales made in/upon, or from the premises during each quarter of the term hereof, less the Deduction Sum, so that the Percentage Rent shall be computed and adjusted on a quarterly basis. If the total of quarterly installments of Percentage Rent for any calendar year or partial calendar year then Tenant at the time it submits their last quarterly installment for that year shall pay Landlord any deficiency, or Landlord upon receipt of such annual statement shall issue to Tenant a credit invoice for such excess, as the case may be. Percentage Rent shall be computed separately with respect to each calendar year (or partial calendar year). There shall be no carry-backs or carry-forwards from one calendar year to another calendar year. All sales originating at, on or from the Premises shall be considered as made and completed therein, even though bookkeeping and payment of the account may be transferred to another place for collection and even though actual filling of the sale or service order and actual delivery of the merchandise may be made from a place other than the Premises. d. MONTHLY STATEMENT OF EXCLUDED ITEMS. Tenant shall provide a monthly statement, indicating the total amount of all excluded items from Net Sales and shall for three (3) years thereafter have underlying records available for Landlord's inspection verifying such items Sales upon credit shall be deemed cash sales and shall be included in Net Sales in the period in which the merchandise is delivered to the customer, whether or not title to the merchandise passes with such delivery. e. NET RECORDS. Tenant shall keep full, complete and proper book records and accounts of its daily Net Sales, both for cash and on credit, for each separate department, subtenant, and concessionaire operating at any time in the Premises, Landlord and its agents and employees shall have the right to examine and inspect during normal any sales tax reports pertaining to the business of Tenant conducting in, upon or from the Premises for the purpose of investigating and verifying the accuracy of any statement of Net Sales. Landlord may cause an audit of the business of Tenant to be made by an accountant of Landlord's selection, and if any statement of Net Sales previously made to Landlord shall be found to be inaccurate, then an adjustment shall be made within thirty (30) days in order to settle in full the accurate amount of percentage rent that should have been paid for the period or periods covered by such inaccurate statement or statements. Tenant shall keep all said records for a minimum period of three (3) years. Should said audit disclose that Tenant has understated Net Sales by three (3%) or more for any month so audited, then Tenant shall pay to Landlord as additional rent within thirty (30) days after receipt of billing from Landlord the cost of such audit for said month; otherwise, the cost of such audit shall be paid by Landlord. If such audit shall disclose any willful or fraudulent inaccuracies, this Lease may be terminated at the option of Landlord. f. WASTE DISPOSAL CHARGES. Tenant shall pay to Landlord the cost, if any, reasonably incurred by Landlord for the hauling, dumping or removal of Tenant's trash, waste or refuse in excess of three (3) cubic yards per day. The cost incurred by Landlord for the hauling, dumping or removal of Tenant's trash, waste or refuse not in excess of three (3) cubic yards shall be paid by Landlord and included in Basic Cost. g. PAYMENT. Except as otherwise specifically provided herein, any sum, amount, item or charge designated or considered as additional rent in this Lease or any other sum, amount, item or charge payable by Tenant to Landlord pursuant to this Lease shall be paid by Tenant to Landlord on the first day of the month following the date on which Landlord notifies Tenant of the amount payable or on the tenth day after the giving of such notice, whichever shall be later. Any such notice shall specify in reasonable detail the basis of such additional rent. Such sums shall be paid by Tenant to Landlord without offset or deduction. 4. LATE PAYMENTS. If Tenant fails to pay when due and payable any rent or other sums due from Tenant under this Lease, the unpaid amounts shall bear interest at the rate of twelve (12%) per annum (not to exceed the maximum lawful rate) from the date due to the date paid. Tenant hereby acknowledges that late payment by Tenant to Landlord of rent and other sums due hereunder will cause Landlord to incur costs not contemplated by this Lease, the exact amount of which will be extremely difficult to ascertain. Such costs include, but are not limited to, processing and accounting charges and late charges which may be imposed on Landlord by the terms of any trust deed covering the Premises. Accordingly, if any installment of rent or other sum due from Tenant shall not be received by Landlord or Landlord's designee within ten (10) days after such amount shall be due, Tenant shall pay to Landlord a late charge equal to four (4%) of such overdue amount. No late charge may be imposed more than once for the same late rental payment. The parties hereby agree that such late charge by Landlord shall, in no event, constitute a waiver of Tenant's default with respect to such overdue amount nor prevent Landlord from exercising any of the other rights and remedies granted at law or equity or pursuant to this Lease.